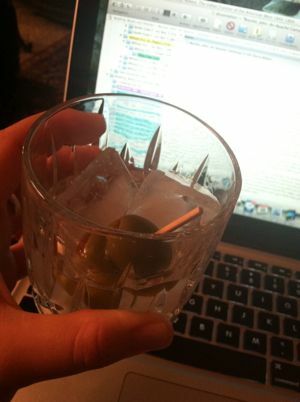 Yes, Dad, I’ll have a martini with my transcription, thankyouverymuch. Proof that bathroom mirror photos can be way more glamorous. (Note the poinsettia in the shower.) I found this awesome 100% wool sweater of cable-y goodness in my childhood closet (which is now mostly filled with my mom’s stuff). I think I asked for this for Christmas about ten years ago, and Santa delivered. And within a few years, somehow, it seemed out of style. To be fair, I moved to Southeast Asia and then to the desert, where a super-dense sweater might not be the first thing to reach for. And I didn’t yet knit. Anyway, I’m so happy to have found it. I pulled it on this morning over whatever I was wearing as I worked, and I love it. I imagine this will be a go-to sweater for taking Boh out as the mornings get colder. Time to unpack and then enjoy the leftovers I brought home with me! 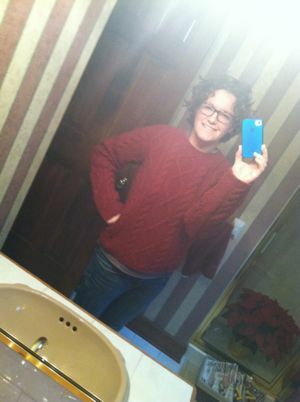 This entry was posted in life and tagged boh, cabled sweater, holidays by barefootrooster. Bookmark the permalink. Having had dogs and cats, I know that they will always find the sweet spot in front of the fireplace when it’s lit, or the heat(or AC in the summer) vent. Our carpet always had a permanent dark spot in front of the vents closest to us. Good for you for being able to fit into that sweater, that is an accomplishment to be celebrated. Enjoy the leftovers, share a bit with Boh. I still have my daughter here until tomorrow morning. How good it is to have family together. And, yes, she’s taking leftovers back tomorrow.That’s what moms are for! Sounds like a great weekend! What a terrific item to unearth from your closet. I liberated a fondue pot from my parents’ basement over the weekend. You never know what treasures you’ll find! 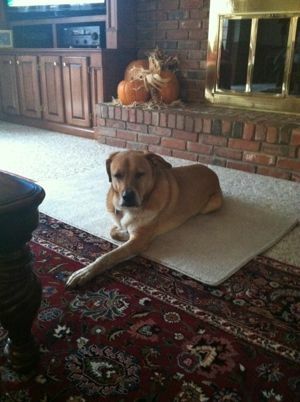 I’m glad Boh found the best seat in the house– Alice has a similar knack, especially in the winter. And that’s a fabulous sweater find! Every once in a while I come across some long-forgotten treasure in the back of a closet … enjoy the leftovers! Sounds like a very nice holiday. The sweater made me inexplicably happy to hear about–I’m purging so much of my stuff for my move and feeling guilty about hanging on to some things, but it’s important to hang on to the important things. So glad you had a nice time! Clever Boh! Glad you had a nice holiday and found such a treasure in the closet!